Santiago de Chile is a huge city with several district articles containing sightseeing, restaurant, nightlife and accommodation listings — have a look at each of them. 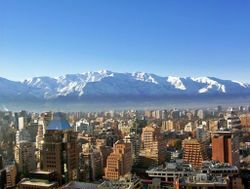 Santiago de Chile, usually shortened to Santiago, is the capital and economic centre of Chile. With its museums, events, theaters, restaurants, bars and other entertainment and cultural opportunities, it is the political and cultural center of the country. Its central location makes it a convenient base point to further explore the country. Due to its proximity to both mountains and the Pacific Ocean, It is possible to ski in the nearby Andes and later be on the beach, all in the same day. Entertaining activities can also be had in the city in its many malls. 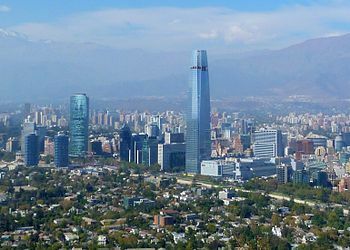 Santiago is a fast growing city located in the central valley of Chile between the Andes mountains range to the east and the Cordillera of the Coast to the west. The metropolitan area has about seven million inhabitants. The climate is Mediterranean, with mild winters and very warm and dry summers. During winter, it usually only snows up in the Andes, which are an hour and a half from the city. Temperatures at night can fall to around 0ºC/32°F in the coldest days, but the accumulation of snow is very rare. It gets progressively hotter towards the summer. Summers are fairly dry although you may experience some humidity at times. The temperature can reach as high as 35ºC/95° F. Due to the inversion effect in the Santiago basin and other factors, winter air quality in this area can be unhealthy, in large part due to high concentrations of particulate matter. Pricing in Chilean pesos. 1000 CLP, informally known as a luca, are about USD 1.50 Can check current rates by Googling "CLP to USD." Travelers from Australia have to pay a reciprocity tax/visa fee upon entry, but only by air. This is in response to those same countries' visa fees for Chilean citizens. The one-time charge is valid for as long as the passport is valid and can be paid in cash (USD) or credit card. The fee for Australians is US $112. There is no fee to enter by land. Comodoro Arturo Merino Benítez International Airport, or simply Santiago International Airport and Pudahuel Airport ((IATA: SCL) (ICAO: SCEL) is the main Chilean gateway for international flights. The travel time to the city center has been drastically reduced recently, with the construction of a new tollway, the Costanera Norte. There are airport buses running on two slightly different routes to the center of town operated by CentroPuerto and TurBus. The Centopuerto bus is a single decker bus with limited luggage storage space and a very narrow door to enter through. The TurBus is a double-decker with a lot more room for storage. Both of these buses can be caught between airport exit doors 4 & 5. Both charge Ch$1800 (as of Nov 2017) one-way, with Centropuerto running every 10 minutes to Los Heroes metro station and TurBus every 30 minutes. However, both buses also stop at the Pajaritos Metro station en route, and due to the heavy traffic east of Pajaritos during peak hours it is a good idea to alight here and take the Metro line 1 towards Los Dominicos to the city center (10-15 min). Be sure to ask that the CentroPuerto bus is going to the center - one only goes back and forth to a parking lot. Private taxis will charge about Ch$15,000 for a trip to downtown or Providencia. Please note that unofficial taxis may take advantage of unknowing foreigners and charge as much as CLP $200.000 (US$400) for a trip to Centro or Providencia. It is easy to identify unofficial taxis, most drivers will not have any type of identification, and will insist on taking you to the ATM's around the airport where they will convince you to take out the highest allowed amount (200.000 CLP). Common sense and sticking to official taxis should get you to the city with no problem, but stay alert because a considerable number of foreigners fall victim to taxi scams. From Canada, Air Canada operates a flight from Toronto five to seven days per week. From Europe, Air France operates to Paris, British Airways to London, Iberia to Madrid, Alitalia to Rome, and LATAM to Madrid and Frankfurt. Flight time is 14h from Paris (Air France), 14h 30m from London, 13h from Madrid and 18h from Frankfurt. Air France uses Boeing 777-200ER aircraft and Iberia Airbus A340 planes. Both British Airways and LATAM fly the new B787 aircraft on SCL-LHR (BA) and SCL-MAD-FRA (LATAM). From Oceania, Qantas operates a non-stop flight from Sydney three times a week using a B747. LATAM also operates one daily flight from Sydney to Santiago via Auckland and has a nonstop flight to Melbourne. It's at least 12 hours each way. LAN also operates a Tahiti-Easter Island-Santiago route. From the US, American Airlines and LATAM operate flights from Miami, New York, Los Angeles, and Dallas. Some flights have layovers in Guayaquil or Lima, but all of them have non-stop services. Delta Air Lines operates non-stop flights from Atlanta and United Airlines operates non-stop flights from Houston. Many of these flights are overnight, and most use widebody aircraft such as the Boeing 767. From Latin America, Latam - a OneWorld airline - (former LAN and TAM) has the most extensive network from/to Santiago: operates flights from Buenos Aires, Rio de Janeiro, Lima, Sao Paulo, Quito, Guayaquil, Bogotá, La Paz, Santa Cruz, Mexico City, Havana, Punta Cana, among others. Avianca - Star Alliance -  has 3 daily non-stop flights from Bogotá and one from Lima. Copa Airlines operates 3 daily non-stop flights from Panama City. Also Aerolineas Argentinas, Gol (former Varig) Aeromexico and Sky Airlines operate from Santiago. If you are renting a car, the rental car company counters are all located together to one's left after clearing customs in the international terminal. There is a separate set of rental car counters before customs (so you can rent a car while waiting at the baggage claim), but they are not always staffed. After you get your contract, you have to walk outside, turn left, and walk east, then cross the street to the south to a small lot where the rental cars are kept and present your contract to the attendant on duty to obtain your rental car. When you return the vehicle, you must return to the same lot. Because the airport rental car lot is far too small, traffic jams and delays are frequent, so arrive early. At return, the attendant inspects the vehicle and fills out a return checklist form in carbon copy, then gives you one of the copies, which you bring back to the inside counter to close out your contract. Entering Santiago by car, you'll probably find yourself on the Autopista Central. To use this freeway you need a "TAG" toll transponder or a day pass which you can buy from service stations. One day passes are Ch$4400. You can also buy it after accidentally passing through it without one. If you rent a car at the airport or anywhere in Santiago, the rental car company is required to include a TAG toll transponder in the vehicle and charge you for it. A great alternative to taxis is to book a private ground transfer. Companies such as Royal American Santiago provides pre-arranged private airport transfers to and from SCL Airport, chauffeured services around the city, with bilingual drivers. There are bus connections to all major destinations on the continent. The bus ride between Santiago and Mendoza in Argentina has beautiful mountain views (Andes mountain) and takes about eight hours, depending on the time spent at the Cristo Redentor checkpoint. Companies as El Rápido Internacional are usual to make this route. The border crossing is at about 2800 m in the Andes. Note that fruit, vegetables or animal products are not allowed in either direction; all luggage will get checked at the border. One way fares are listed at around Ch$17,000 but are often cheaper if booked in advance. There are also buses to and from San Juan, Argentina, with one-way fares listed at around Ch$19,500. One way fares to and from Lima are listed at around Ch$85,000, companies that serve the route include Cruz del Sur and Ormeño Perú. Terminal Alameda: Universidad de Santiago subway station, Line 1). Private station for Turbus and Pullman buses. National and international departures. Phone: 7762424. Has a hotel and a few convenience shops. Terminal Santiago: Alameda 3848 (Universidad de Santiago subway station, line 1; across the street from Turbus Terminal). Phone: 3761755. A little less safe than Turbus Terminal, yet not dangerous. Beware of pickpockets and people trying to sell you robbed goods (iPods and cell phones are a common target). Has a food court with local fast food restaurants and a McDonald's. Note that prior to national holidays, it may be extremely overcrowded. Chilean currency is Chilean Peso. It is different than the Mexican Peso, Argentinian Peso, etc. Foreign currency is usually not accepted in stores, however, some tourist places may offer change at a higher rate. You can only use most of the ATMs. Just make sure that they display signs of the card you want to use or that they are operated by "Transbank" or "Redbanc". You will not be able to withdraw money from Banco Falabella, Banco Paris or Banco Ripley ATMs. ATMs are widely available in the city, however, in rural areas, it will be more difficult to find one and they may run out of money on during high seasons. Fees for withdrawing money on ATMs are expensive. The charge will vary from CLP$3,000 to CLP$6,000 depending on the amount and the bank that owns the ATM. All ATMs have an identical user interface. When the total fee is displayed on the screen, you will see a comment stating that 'it includes Govt. tax'; meaning that no additional tax will be applied to the fee. Half a dozen of Bureau de Change are located on Agustinas, between Bandera and Ahumada should you wish to shop around for best rates. They only operate during business hours so changing money after 6:30 pm may not be easy. Los Cobres de Vitacura, in Vitacura, has also three Bureau de Change. Hotels and the Bureau de Change at the airport charge higher fees than the ones located in the city. Convert all your leftovers to another currency (preferably not at the airport) before leaving the country since changing to another currency even in an adjacent country could trigger 40 - 50% commission. Beware of people in the streets offering to find a place to change money with better rates than official bureaus. They're scam artists who will take your currency, pretend to go change it into pesos in the nearest buildings and disappear with your cash. Many downtown buildings have posters in Spanish (and often in English too) about this common scam, stating that either there are no change bureaus inside or that the ones there don't send their employees to get clients on the streets. If you are staying in town more than a few days get a Bip! card at any subway station (Ch$1350, minimum recharge Ch$1000 [February, 2013]). This radio-frequency card works for both subway and bus. With this card, you pay the first use and allows free-charge for a total of 3 times including the first use, for a 2-hour period if you take up to 3 different buses without the subway. Depending on the time of the day, combining bus and subway may add an additional fare of Ch$80 (peak) or Ch$20 (shoulder period). Notice that you still have to mark the card. For more information, see Transantiago official website (es). Metro Santiago has a metro system with seven lines and 136 stations, with many holding rotating art exhibitions. Trains run between roughly 6.00AM and 11.00PM, with each station posting the exact hours for the first and last trains. Buses run parallel to subway lines after hours. Tickets cost Ch$720 for peak periods (7.00AM to 9.00AM, 6.00 to 8.00PM), Ch$660 for shoulder periods since January 2018. During peak hours, the trains are usually very packed with passengers, so that new passengers have to wait for the next train or try getting on the train with a little more insistence. Traveling with a lot of luggage during peak hours on public transports is generally not recommended. Bus Buses are mostly modern and run around the clock on the main lines. The only way to pay your fare is by bip!-card. You can buy this card and charge it in any metro station or in some stores. Rent a Car Renting a Car is also a very good decision if you want to get around Santiago and its surroundings. You can find excellent cars, great service and cheap prices at Chilean Rent a Car (www.chileanrentacar.cl). The company is conveniently located a few blocks away from Metro Baquedano in Barrio Bellavista, a "must visit" in Santiago. Parque Metropolitano - This vast park is home to Cerro San Cristóbal. From the top there is a beautiful view over the city and, on a clear day, the Andes. The summit can be reached by funicular ($1500 one way, $2000 return), or a 40-60 minute hike. In the park, there is also a botanical garden, zoo and two swimming pools. Pope John Paul II visited its summit in 1987. The famous cableway (teleférico) was closed for years, but now it has been completely revamped and re-opened (prices from $1310 one way). Plaza De Armas - The capital's main plaza, also the site of the national cathedral and main post office. It's a few blocks from the traditional Central Market and has its own Metro Station. During the last years, Plaza de Armas has been used as a meeting and recreation place for the community of Peruvian immigrants. This has led to lots of cheap international calling centers, traditional Peruvian restaurants and Peruvian spice and food stores, being an interesting place to walk during day hours. Catedral Metropolitana - The aforementioned National Cathedral, formed by the Palacio Arzobispal (the main office of the diocese), the Templo del Sagrario (Sacred Temple, standing in the place of the first chapel ever in Santiago and hosting a very beloved statue of of Our Lady of the Carmel) and the temple itself. A nice neoclassical-style building with several interesting spots and views, including the tomb of statesman Diego Portales, the crypts of many bishops and archbishops, several altars, etc. Free access, if you get there in specific hours you may be able to attend mass itself. Mercado Central - The central market of Santiago de Chile. It was opened in 1872 and Fermín Vivaceta was in charge of its construction. The market replaced the Plaza del Abasto, which was destroyed by a fire in 1864. Now it's a rather thriving place with not only market-like stands selling food (specially fresh seafood), but also many restaurants. Mercado de Abasto Tirso de Molina, better known as La Vega - another market that is few blocks away from the Mercado Central and very close to Patronato (see below). It sells groceries, vegetables and fruits (including traditional Peruvian ingredients), but also has restaurants and some cheap clothes in it second floor. Santiago Centro - The Centro (Downtown) area is a nice place for a stroll down some of its major Paseos (streets turned pedestrian walkways), but be aware of pickpockets. There are also many stores, shopping arcades, fast food restaurants, coffee shops, etc. Centro Cultural Palacio de La Moneda - An underground cultural center under the La Moneda Palace, with rotating art and cultural exhibitions all year. Local crafts and souvenirs are available at middle-high prices in the local gift shop. A café is also within the facilities. Note that most exhibitions are not free of charge, however, prices are very affordable. Parque Forestal - A long park that runs parallel to the Mapocho River, also site of the National Museum of Fine Arts and Modern Art Museum. Theatre & Dance - Santiago offers much in the performing arts, most takes place Friday & Saturday, check listings in El Mercurio. $500-5000 CLP, most offer discounts with student ID, even to foreigners, just ask. Sky Costanera - Observation deck at the tallest building in Ibero-america. Has both an indoor and outdoor observatory that provide a 360° view of Santiago when the sky is clear. Tickets for weekends/holidays are priced higher than those for Monday to Thursday. Jazz Clubs - Santiago is home to an impressive jazz scene, with several intimate clubs scattered throughout the city. The Club de Jazz de Santiago is arguably the best. Located in the northern part of the Nunoa neighborhood, this small club routinely brings in some of the best local, national, and international artists specializing in everything from latin jazz to blues to bossa nova. Check music listings in El Mercurio. Festival de Jazz de Providencia - A very good jazz Festival takes place during summer (typically each February) in Providencia. The Festival de Jazz de Providencia takes place each year in Mapocho's riverside and showcasts the best local bands and some international guests. Tickets are cheap (from about 3 USD in the 2007 edition), so it's a good alternative for summer nights. Cerro Santa Lucia, Junction of Santa Lucia and Bernando O'Higgins (Santa Lucia metro station). Wineries Visit the Cousino Macul winery and vineyards. Tours are in English and Spanish. Price for a basic tour is 9000 $ch which includes tasting 4 wines and a 45 minute tour of the beautiful buildings and vines(October 2015) although they offer lots of tours with more tastings and food for a higher cost. To get there, take the metro to Quillin Station (line 4) which costs around $ch700 each way and takes about 40 minutes from downtown. When you leave the station go East (left as you exit the station) on the street also called Quilin, the road winds past new houses of the same name as the vineyard and you'll arrive there after about a 40 minute walk. Ruta Chile  Ruta Chile is an agency with more than 18 years of experience, offering the best prices and more than 53 excursions, transfers and tours in Santiago. Spicy Chile Tours  Spicy Chile is one of the more experienced free walking tours companies in Santiago. They have 3 different tours daily, from Monday to Saturday. The guides mix historical information with the best anecdotes and recommendations so you can get full advantage of the city. One of their daily tours is "Good Morning Santiago" which is a good way to start once you hit Santiago. It introduces the city while you discover all the highlights, mixing historical monuments, such as Santiago's Cathedral, with the main institutional buildings like La Moneda, and even passing through the traditional "Café con Piernas". The meeting point is in front of La Moneda Palace, in the corner of Teatinos and Lib. Bdo. O'Higgins just a few steps away from Metro Moneda, and starts from Monday to Saturday at 10 AM and 2 PM. There are numerous opportunities in the hostels that dot Santiago - contact them individually. Most offer free accommodation in return for work in the hostel, and require a minimum stay of 2 weeks. Many foreigners also find work teaching English. The majority of institutions require a qualification such as CELTA or TESOL, and big employers include the Instituto Chileno Britanico and universities. In the malls you can find a variety of retail stores and Falabella, París and Ripley, the most famous department stores in Chile. The biggest ones are Parque Arauco and Alto Las Condes, they both have good restaurants and the former has a good agenda of free music and shows. You can get to the former from Escuela Militar metro station and to the latter from Los Domínicos; ask locals for directions if you're unsure of how to take buses. Alonso de Córdova Street and Nueva Costanera Avenue are very exclusive areas where you can find high fashion and luxury stores like Louis Vuitton, Hermés or local designers. In this area you find great restaurants and art galleries. If you prefer buying handcrafts, the ones in the Centro Artesanal Santa Lucia are good and relatively cheap compared with other handcrafts stores. Other handcrafts centres are in Bellavista (though a bit more expensive). If you need outdoor gear, there are several shops in Santiago with a particular concentration on the upper floors of the Costanera Center mall. Here you can find several high-end North American retailers like North Face, Mountain Hardware, and Columbia. There is also Chilean retailer Doite that sells supplies like gas, flashlights and cookware at reasonable prices. Close to Los Domínicos metro station is Pueblito Los Domínicos steps from Los Domínicos metro station; it is more expensive but has a wide variety of local handcrafts and antiques, as well as a small exhibition room and a bonsai exhibition behind it. It is very pretty with an artificial stream in a colonial-looking atmosphere. Half of the people there are usually tourists during the summer, so you won't be alone! Plaza Nuñoa has some small shops in the plaza where you can buy books from Latin America (Neruda, Allende, Cortazar) and also handcrafts. If you're already kinda familiar with Santiago, you can also go to Patronato which is located near to the downtown area and it's easy to reach by metro (Patronato metro Station). There you'll find cheap clothes, food and products of all kinds, as well as some foreign stores (mainly Chinese, Koreans, Peruvians and from the Middle East), thus allowing you to save quite a bit of money. It would be better to go alongside a local, though, since it's easy to get lost due to the very short and slim streets and the very high quotient of visitors. Beware of pickpocketers. Similarly, those who want more surprises and know the basics about Santiago can go to the famous Persa Bio-Bio (Bio-Bio Persian market), located in the Franklin area, also not too far from downtown and near to the metro (Franklin station). It can be described as a giant flea market that opens every weekend business hours. It offers antiques, tools, handmade furniture, craftsmanship, Cheap Chinese stuff, many food stores, etc. Again, it's not a place for novices: a local's presence would be desired, as it may get difficult to find someone English-spoken in the market. You will find most of antiquities and very cool rare stuff in Persa Victor Manuel between Victor Manuel and San Isidro. A place very skipped by tourists but a visit is extremely advised. Persa Bio-Bio may take you 4-6 hrs to discover, but it also offers very nice and cheap national and international food courts; the Thai eatery Lai Thai and the churrasco stall Carlitos el Rey are specially popular. Nightlife choices vary widely across the city and their location usually reflects their price and style. Barrio Bellavista and Barrio Brasil are popular spots close to the city center. 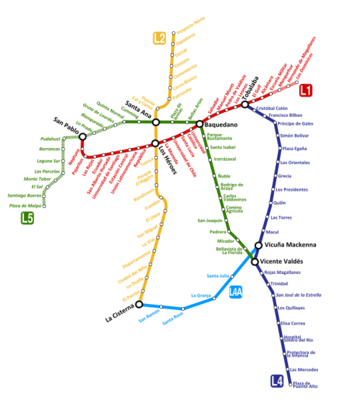 Bellavista can be reached by Metro to Baquedano, or by bus to Plaza Italia. Cross the bridge will bring you to Pio Nono, which probably has highest density of bars in Chile. Bellavista has a wide range of choices from popular places to upscale, such as a jazz bar. In addition, there are discos with all kinds of music, from contemporary eletro-pop to salsa and merengue. This is probably the only barrio where you can find a disco that has a predominately gay audience. It is a fun atmosphere and features drag-queen shows during Saturday nights. Moreover, Bellavista is the area that lasts the longest during Friday and Saturday nights, with most places closing at 4-5AM, and a few places (so called "after hours") run till 6-7AM. Plaza San Enrique is a park located in Lo Barnechea (at the far north-east of the city) which is surrounded by nightclubs. The most popular one is Sala Murano (it can get very crowded!). People who attend are mostly 18-25 and it is one of the safest places to party. Most people there are from upper-middle to high class, so it is more expensive than other neighbourhoods. Typically, females get in for free, while males pay around 3k-5k CLP. You can get there by micro, but though buses do pass later on, you might have to wait up to an hour for it. Barrio Manuel Montt has a small and unique atmosphere with mid-range prices. It can be reached at Metro Manuel Montt (line 1). Isidora Goyenechea is a very nice and safe neighbourhood with plenty of restaurants, albeit expensive ones. Take the Metro to El Golf. Plaza Ñuñoa is a district east of the central area and is another popular spot nightlife spot. Vitacura is located pretty far east (towards the Andes). It is composed of bars and some places where you can dance. The places are nice and although they certainly lack cohesiveness as nightlife (since bars only recently started opening there) it can be fun to go. It is more expensive that other areas of Santiago and frequented by people that live in the eastern (wealthier) side of the city. Although you can get there by bus, it will be hard to leave on anything but a taxi since buses don't run late. Pio Nono. til 5AM. Pio Nono in Bella Vista has an intense feeling, bars line the street on either side. The area has a very youthful quality but older visitors shouldn't be intimidated. One of the most lively areas of the city at the weekend. Hostal Romandia Román Díaz 1403, ☎ +5628913188 Located in a quiet residential district, the Hostal Romandia is a central Santiago de Chile bed and breakfast style accommodation perfect for business travelers, students, or guests who want to get a good night's sleep in order to discover the fascinating city of Santiago's attractions during their stay. Atacama Hostel Roman Diaz 130, , ☎ +562264201. Hostel is close to bars, restaurants, clubs and both the bus and subway station. Newly remodeled rooms are cozy and colorful, large common room with lots of places to hang out and TV and DVDs, the terrace is a great place for a BBQ and views of the city. The water temperature in the showers here can be a bit temperamental. Hostal Santa Lucia 168, Santa Lucia 168, . Looks toward the Santa Lucia hill and just blocks away from the centre. Great personal staff and good breakfast with fresh fruits. Hostal del Barrio General Ekdhal 159, Barrio Bellavista. Hostel in a quiet area but nonetheless quite near to the hotspots of Barrio Bellavista. The rooms are not huge but very clean, including the bathroom. New owners as of August 2012. Very friendly and helpful staff. C$20,000 for a single with own bathroom. A breakfast of bread, ham, cheese, jam, tea and coffee is included. for contact page and to email a reservation. Fast response. Hostal de la Barra, José Miguel de la Barra 451 (near to Museum Bellas Artes and Parque Forestal) , ☎ +56 2 6392384 This hostel is run directly in a old building in the middle of Neighborhood Bellas Artes, it has high quality infrastructure and also has a very nice coffee shop next door where the breakfast is served: The drawback is the 6 lane road outside which is rarely quiet and the early morning revellers returning home. Sleep is at a premium here. Good points are the staff, the location and the nearby park areas. Castillo Surfista Hostel Maria Luisa Santander 0329, ☎ +5628933350  Opened by a California surfer in January 2012, this rapidly up and coming hostel is a new and rare accommodation that is located a short walk from everything, but the neighborhood is safe and quiet (close to Metro Baquedano in Barrio Providencia). Private rooms, shared dorms, SURF TRIPS, in house Spanish classes, and student housing in Santiago are available. Dominica Hostel  Dominica 24, Bellavista +5627327196 This newly restored old house was especially design to receive travelers. Full of common spaces and with a practical design of the dorms rooms. Located close to Cerro San Cristobal. Hostal Providencia  Vicuña Mackenna 92-A, Providencia +562 6352536 Rooms with private & shared bathrooms a house with an antique Chilean style with a modern twist. Staff is very helpful. Breakfast, BBQ, common areas with free internet and Wi-Fi, cableTV, books and DVD library. Located only 3 min walking from Metro Baquedano, Plaza Italia and walking distance to Bellavista neighborhood. Casa Bonita Bed&Breakfast, Pasaje Republica 5 (in Santiago Centro, 100 mts. from the Republica metro station), , [email protected] Established in a national monument in a protected historical neigbourhood, opened at the beginning of 2009. It offers single and double rooms with or without private bathroom and also has rooms for three or four persons. All rooms have central heating, cable TV and Wi-Fi signal. Rates start from US$58 for a single and US$67 for a double. A varied breakfast, internet access and cable TV are included. This B&B is personally run by its owners, a Dutch-Chilean marriage. El Arca de la Ermita - Ecological Cabin Phone: 00 56 9 77291539 - 00 56 9 62940905, Facebook:https://www.facebook.com/EL-ARCA-DE-LA-ERMITA-223774617642157/photos?ref=page_internal) Email: [email protected] At about 20 minutes out of Santiago, on the road Camino a Farellones, district of Lo Barnechea, El Arca de la Ermita is an ecological cabin fully equipped that can host up to 2 people. Ideal to relax, have some rest during the trip and enjoy the nature. The surroundings are still quite natural and wonderful, the view of the Andes, the river and the birds singing, access to trekking routes, hammock, barbecue grill and a garden at your disposition. The cabin is at about 30 minutes from the ski centers; Farellones, Valle Nevado and the Colorado. As it is remote from the city, they offer transport from the Plaza San Enrique, district of Lo Barnechea and also a parking lot. The contact with the hosts, a young and dynamic couple, is very personalized and warm. Santiago's air quality can decline during the winter (May-September). The locals welcome the rain which falls during winters as it cleans the air. Be sure to carry bottled water with you during the summer and avoid food or drink from street-vendors. Be prepared for sauna-heat on the metro during summer. By South American standards Santiago is a safe city, but visitors should be aware of pickpocketing and other petty crimes. Avoid parks at night and don't wear expensive looking jewelry or watches even during the day. If you're alone, avoid large crowds of people, especially downtown. If you happen to have bad luck and get robbed, do as you're told by the criminal and if you don't understand Spanish, give away your false wallet. Thieves in Chile are often impatient and don't read very well. They are likely to beat the bejeezus out of you if you don't give them something that at least appears to be valuable. Don't flash your cell phone or camera. Carefully hide such valuable when not using them. If you're getting robbed and the criminal has spotted the camera expect to give it away too if you want to stay out of hospital. Do always count your money out loud to taxi drivers before handing, as they don't have the best reputation. If someone approaches you on the streets and promises to get you better chances at changing your dollars/euros into Chilean pesos, NEVER accept their deals. They're con-people who take advantage of foreigners not knowing the details about currency and confuse them with big words to take their cash away. Only change your money in legal currency exchange centers, which may take more time but are much more trustworthy. There's one in the Airport but it has poor exchange rates, and there are many more downtown and in financial areas or in the malls. If you are going to see a football match (soccer game), be careful with the "barras bravas" who are the most fanatic but also dangerous fans. They are often involved in troubles with the police both inside the stadium and outside. Avoid buying tickets in the sections where the bravas dominate which it often does behind the goals. The middle section is the safest but if you have a friend who wants to support Colo-Colo and another Universidad de Chile for example, avoid showing it. Even if the middle section is safe, showing different shirts can cause you trouble. Either go with the same shirts or dress neutral. Other football matches not being the "Superclásico" between Universidad de Chile against Colo-Colo should be pretty safe. Walking to the stadium you will find people begging for some pesos so they can see the match. Avoid giving them if you want to stay out of trouble. The barrio where the Estadio Nacional is located is a place which is normally peaceful, except during football matches, when football fans tend to get rounded up. You have to walk with precaution and keep your eyes on other people when it's crowded. It's better to take a taxi to the arena, or a rental car if you can find a place to park it (but beware of breakins). There are some neighbourhoods/barrios that should be avoided. Even if few carabineros and locals speak English, they are the ones who know which areas are to be avoided since some of them are accessible by metro. If you see fewer tall buildings and more houses with barred windows and entrances, then turn back. The changes happen very slowly, unlike some other Latin American cities, so you'd have to travel quite a lot from a wealthy safe neighbourhood to a dangerous ghetto. Avoid especially La Legua (not to be confused with La Ligua in the V Región or La Lengua on sale at the carnicería) which is famed in Chile for its high crime rates and single police cars won't even enter the area. When police have to enter this area they sometimes use armoured cars. When it comes to nightlife, keep an eye on your surroundings if you go to Bellavista. Some parts of it are frequented place by criminals and fights involving stabbed people and even homicides sometimes happen on public streets in this area. Try staying away from the following comunas: Lo Espejo, La Pintana, Puente Alto (especially the Plaza de Armas), La Cisterna, San Joaquín, El Bosque (not to be confused with a neighbourhood located around metro El Golf, which is in Las Condes), San Ramón and La Granja unless you know exactly where you're going. Though these places are not completely unsafe for the most part, they can have a few unsafe spots and don't have much touristic significance. The safest comunas are Providencia, Vitacura, Ñuñoa, La Reina and Las Condes. All of them have lots of local security guards, besides Carabineros, and locals are more likely to speak English, especially young people. They are not completely safe, though: petty theft still takes place, so keep your eyes open. Lo Barnechea can be tricky as it is the only comuna that has both extremely wealthy and extremely poor neighbourhoods; "La Dehesa" is wealthy and safe, "Cerro Dieciocho" is as dangerous as Cerro Veinte and La Legua. The subway (Metro) is regarded as safer for travelling amongst the locals, even though security has increased in the buses after the introduction of Transantiago. Although some locals still prefer using the subway especially when it gets darker, since almost all the stations have guards. Don't expect the staff to speak much English. Pickpockets are very active on the metro cars, especially during peak travel hours. Always take off your backpack and wear it on the front when you are walking in Santiago Centro. You can trust in the Carabineros (Chilean Police). Although you can hardly find one who can speak English, they will try to answer your questions, solve your problems or give you orientations. DO NOT ATTEMPT TO BRIBE Chilean Police. If you wish to mail a letter or postcard, the biggest post office is Correo Central on the North Side of Plaza de Armas, a neoclassical building with French influences. There are several smaller post offices spread in the city, often close to the bigger avenues. However, Chilean mail has become infamous for not getting things delivered or mailmen opening the letters trying to find money or any valuable items (mostly on mail coming from abroad). The largest and most trustworthy private mail company is Chilexpress, which has agencies on almost all mid-sized cities. Prices are a bit higher though. If you are staying in the city for a while and expecting mail from abroad be aware that mail using the normal postal system is very slow. Postcards and letters from Europe can easily take 4/5 weeks to arrive at their destination in the capital. You can buy bus tickets online at recorrido.cl, the prices are the same as the ticket office if you have a Chilean card or at a slightly higher price in US Dollars via PayPal for international cards. The port city of Valparaiso is also 90 minutes away at the coast. If you want to see a second city Valparaiso makes a fascinating contrast with its bohemian reputation and bright painted buildings. Isla Negra, a village in the coast, south of Valparaíso. The main and most beloved house of Pablo Neruda is there. This is probably the most interesting of his three houses to visit and the best conserved as it is the only one that the military didn't sack during the coup of 1973. To get there, you can take the Pullman bus ($3700, 2h) from Santiago Alameda station (metro Universidad de Santiago). You can also take the Turbus bus to San Antonio ($1000 - $2000, 1h30) from Alameda as well, and then take a local bus in front of "laPolar" ($450, 30min) that goes along the beautiful coast. Tours in the house cost $3000 and last 30min. Then you can go to the beach. Rancagua is 85 km to the south and has some thermal springs and hiking opportunities nearby. Cajon del Maipo , beautiful in spring, some 75 km south east of Santiago, day trip.Some nice places for lunch and tea; many of them only open on week-ends. Sierras de Bellavista (150 Kms south of Santiago), wonderful little mountain village, especially after a rainy day. Alpine scenery. This page was last edited on 23 March 2019, at 06:15.